You'll appreciate the selection of high-quality homes and cabins we've assembled for rent, with locations all around the Winter Park area. See rates, pics & availability. Warm, comfy chalets situated in Grand Lake, within walking distance of the boardwalk. Enjoy views of Rocky Mountain National Park from your RV or tent site. Camping cabins provide an ideal place to get away from it all. Stay right by the Grand Lake in Colorado! 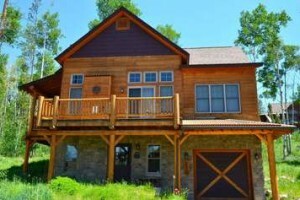 Kickapoo Lodge offers log cabin rentals as well as other enjoyable amenities. Fishing, hunting, horseback riding and swimming are all available at the Latigo Ranch. Oldest ranch near Rocky Mountain National Park along Colorado River, Bar-Lazy offers log cabins and ranch house with modern amenities. Log cabins located 1 mile from the entrance of Rocky Mountain National Park. Explore by land, ski, and air with easy access to Rocky Mountain Park, Winter Park Resort, and hot air balloon rides.